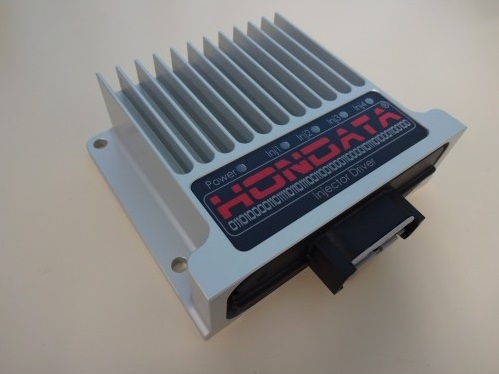 The Hondata injector driver allows you to use high or low impedance injectors without a resistor box - either as injectors slaved to the ECU injector output, or as staged injectors. Staged injection allows the use of primary and secondary injectors of different sizes. The primary injectors are always used, and may be stock or other injectors with a rapid opening time and good spray pattern. The secondary injectors activate based on driving conditions, and may be larger than the primary injectors. The injector sizes and dead times for each set of injectors do not need to be the same. Example: stock 310cc injectors can be used until boost, at which point both 310cc and 1300cc injectors are used. It is also possible to use two independent fuel systems for each set of injectors. For instance, the secondary injectors may use E85 or race gas. I'm using low impedance injectors with a stock ECU without any problems. No, because the way the Hondata Injector Driver controls current through the injectors will result in poor injector performance. You need to use one injector driver per set of injectors.